Mother Nature came to the rescue of Missoula’s public tennis courts this week and did what snow shovels could not, lest they damage the surface. 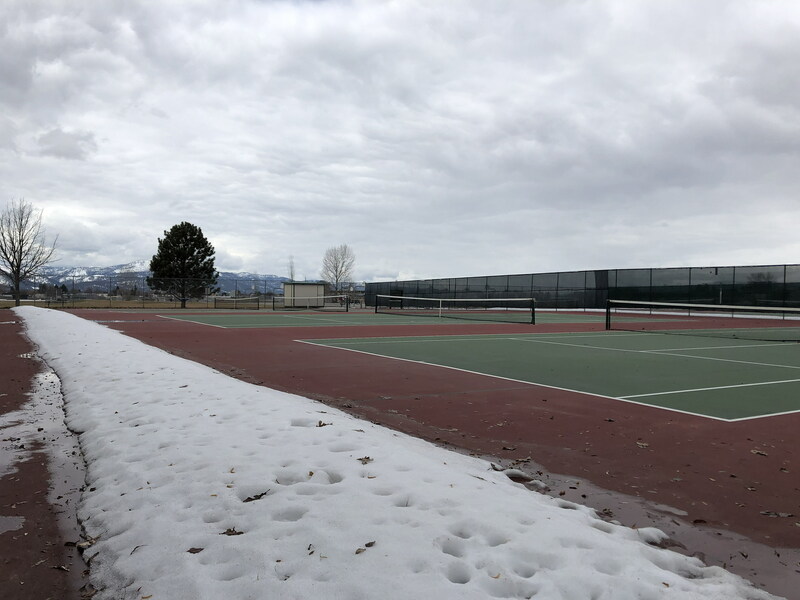 That means local high school tennis teams should be fully back in business on Monday – and that city Parks and Recreation crews will be off the hot seat, although still busy prepping for the complete range of spring sports delayed by Missoula’s lingering winter. A Big Sky High assistant tennis coach came to last Monday’s City Council meeting to beseech city crews to clear snow and ice from the courts, which local high schools use for tennis practice and meets. Some of his players are beginners, coach Steve Schwartz said, and need as much time as possible on the court. And Big Sky’s first home meet, he said, is at the Playfair Park courts on Monday, April 1. But a flurry of emails on Tuesday revealed that city crews could not clear the courts because shovels would damage the surface. Nature would have to just take its course, which was a bit slower than usual this year. By the end of the day, though, the city had scheduled a two-hour practice rotation for the local public and private high school teams that use city courts – on the courts that were clear of snow and ice. And by Friday, after a week of warmer temperatures and rain and the placement of black tarps over some of the courts to hasten the melt – the surfaces were well on their way to readiness. In fact, the only snow still visible was along the edges, well outside the playing surface. And the forecast for coming days was for sunshine and/or rain, but not for new accumulations of snow. In a written statement, Parks and Recreation spokeswoman Rebecca Goodrich emphasized that Missoula had “an extraordinary snow year” and that schools throughout western Montana were facing similar problems with clearing areas for spring sports practices. “Parks and Recreation has been in constant contact with MCPS athletic directors and other user groups,” Goodrich wrote. “The department held a coaches’ meeting in mid-February, and coaches were notified at that time they should make alternate plans for spring practice, as we were likely to have a long winter and the tennis courts’ opening would be delayed. “Parks will continue to open courts and other sports facilities throughout the city as weather conditions permit,” Goodrich said.